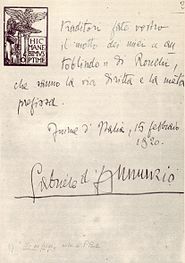 ^ As he used to sign himself (Guglielmo Gatti, Vita di Gabriele d'Annunzio, Firenze, 1956, pp. 1–2). ^ The Italian vate directly stems from Latin vates. Its meaning is a poet with special emphasis on prophetic, inspiring or even divining qualities. 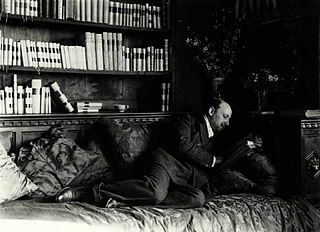 ^ Vivian, Herbert (30 December 1922). "Gabriele D'Annunzio". The Sphere. 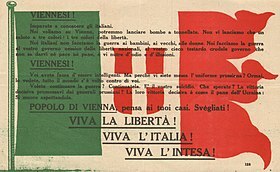 ^ André Geiger Gabriele d'Annunzio, 1918, page 142: "Après la légitimation, et conformément à la loi, il perdit ce nom de Rapagnetta pour prendre le seul nom du père qui l'avait légitimé. 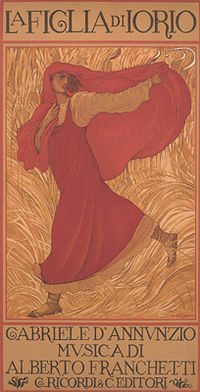 Il est probable que le Camillo Rapagnetta, qui figure dans l'acte de naissance du poète, était un parent, ..."
^ Chisholm, Hugh, ed. (1922). 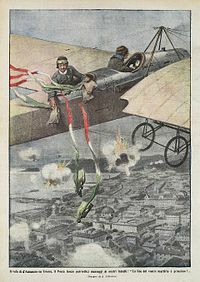 "D'Annunzio, Gabriele" . Encyclopædia Britannica (12th ed.). London & New York. ^ "D'ANNUNZIO PAYS DESERTING SAILORS; Hands Out 10,000 Francs to Crew of Destroyer—Its Officer Bound to Gun.WRANGEL TROOPS NEAR BYMany in Rome Look Hopefully to Giolitti to Find a Way Outof Flume Crisis". The New York Times. 11 December 1920. Retrieved 3 May 2010. ^ Mark Phelan, 'Prophet of the Oppressed Nations: Gabriele D'Annunzio and the Irish Republic, 1919–1921, History Ireland vol. 21, no, 5(Sept/Oct 2013, pp. 44–50. ^ Ekrem Vlora (1973). Lebenserinnerungen: 1912 bis 1925 [Memoirs: 1912–1925] (in German). Walter de Gruyter. p. 154. ISBN 9783486475715. ^ a b Ledeen, Michael Arthur (2001). "Preface". D'Annunzio: the First Duce (2, illustrated ed.). Transaction Publishers. ISBN 9780765807427. ^ Paxton, Robert O. (2005). "Taking Root". The Anatomy of Fascism. Vintage Series (reprint ed.). Random House, Inc. pp. 59–60. ISBN 9781400040940. ^ Richard Doody, "Stati Libero di Fiume – Free State of Fiume". Archived from the original on 8 March 2009. Retrieved 24 August 2002. , The World at War. ^ Cali Ruchala, ""Superman, Supermidget": the Life of Gabriele D'Annunzio, Chapter Seven: The Opera". Archived from the original on 10 February 2005. Retrieved 6 November 2006. CS1 maint: BOT: original-url status unknown (link), Degenerate magazine, Diacritica (2002). Bleiler, Everett (1948). The Checklist of Fantastic Literature. Chicago: Shasta Publishers. p. 22. This article incorporates text from a publication now in the public domain: Chisholm, Hugh, ed. (1911). 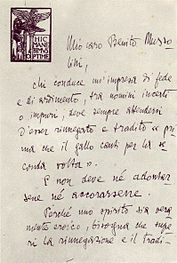 "Annunzio, Gabriele D'" . Encyclopædia Britannica. 2 (11th ed.). Cambridge University Press. David Gilmour, "He Dared the Undarable" The New York Review of Books 6 March 2014, pp. 21–22. Nicoletta Pireddu, "Gabriele D'Annunzio: the art of squandering and the economy of sacrifice,” in _The Question of the Gift. Essays Across Disciplines_, ed. by Mark Osteen (London and New York: Routledge, 2002): 172–190. Nicoletta Pireddu, “’Il divino pregio del dono’: Andrea Sperelli’s economy of pleasures,” _Annali d’italianistica_, 15, 1997: 175–201. 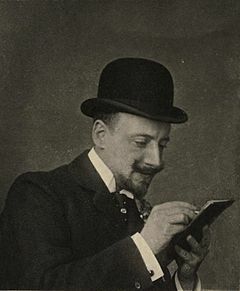 Rudolph Altrocchi (1922). Gabriele D'Annunzio: Poet of Beauty and Decadence. Chicago Literary Club. 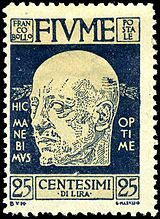 Wikimedia Commons has media related to Gabriele d'Annunzio. This page was last edited on 20 March 2019, at 20:19 (UTC).